Take a dip in the resort's family-friendly pool. Rent a condo with plush furniture, granite kitchens, and lots of space..
Test your skills on the resort's mini golf course. Gather around the fire pit for old-fashioned smores making. Get free shuttle access to Disney, Universal, and SeaWorld. You don't have to leave your room to take in the view - all residences have private balconies. Westgate Blue Tree is located in the heart of Orlando, just a few miles from Walt Disney World’s® main gate. Once you get settled into your condo, get changed into swimsuits, grab goggles and pool toys and get everybody sun-screened up. There are four outdoor pools, and three of them are heated. Set up camp poolside and watch the little ones have a blast on the splash pad. There is no shortage of activities at Westgate Blue Tree. The activities center offers daily activities for both kids and adults. Let the kids go wild in the game room or on the playground while you get your game face on at the tennis, basketball or volleyball courts. When it’s time for lunch, take advantage of the bbq grills and have a family cookout. Recruit the kids to help hot dogs, burgers and sides. Then lay out the toppings and condiments and let everyone go to town. After lunch, challenge the kids to a round of mini golf, ping pong or shuffleboard. One- to two-bedroom condos sleep four to six guests. Full kitchens because sometimes a mini-fridge just doesn’t cut it. Bake your famous chocolate-chip cookies and allow the little ones to assist with the mixing (and the tasting!). Catch the latest episode of your favorite show thanks to your Flatscreen TV with Premium Cable. DVD players are perfect for a low-key night in for family movie night. Bring favorite movies from home, pop some popcorn and call everyone into the living room. Last one on the couch is a rotten egg! Upgrade to a two-bedroom deluxe condo for more space and an in-suite washer/dryer. Westgate Blue Tree provides a free shuttle to the major theme parks. Now the only question is – which one will you visit first? Visit SeaWorld® Orlando to ride Mako, the tallest, fastest and longest rollercoaster in Orlando. Little ones will have a blast at Shamu’s Happy Harbor. Animal experiences include getting up-close and personal with dolphins or interacting with five species of penguins. Catch one of the animal shows; they include dolphins, sea lions and even dogs! Stick around for the nightly fireworks show, Ignite. Magic Kingdom® is home to Walt Disney World’s® most classic and loved attractions. Fly with Peter Pan and the Darling children, get your party on with 999 Happy Haunts, or have a swashbuckling good time with Pirates. Disney Springs features shopping and dining. World of Disney is the world’s largest Disney character store and has apparel, stuffed animals and home goods. Treat yourself to a new handbag at Kate Spade New York, new shades at Sunglass Icon or jewelry at Pandora. Any left handers in your party will definitely want to check out Lefty’s The Left Hand Store. Let the little ones get creative at The Lego Store. Hungry? Blaze Fast Fire’d Pizza, Rainforest Cafe and Earl of Sandwich are just a few of your choices. Don’t forget dessert! Sprinkles Cupcakes and Ghirardelli Ice Cream & Chocolate Shop has you covered. 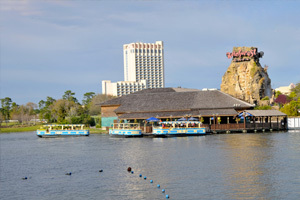 Universal Orlando® is a theme park for movie lovers. Men in Black Alien Attack®, Revenge of the Mummy® and Terminator 2: 3-D® can be found at Universal Studios®. The Wizarding World of Harry Potter® – Diagon Alley has Harry Potter and the Escape from Gringotts, Flight of the Hippogriff and the Leaky Cauldron. Board the Hogwarts Express (with a park-to-park ticket) and head over to The Wizarding World of Harry Potter® – Hogsmeade at Universal’s Islands of Adventure®. Ride Harry Potter and the Forbidden Journey, see a performance from the Frog Choir, watch a Triwizard Spirit Rally and dine at Three Broomsticks. Also at Universal’s Islands of Adventure®: The Amazing Adventures of Spider-Man®, The Incredible Hulk Coaster and Skull Island: Reign of Kong®. - The front desk is open daily from 7:00 AM - 11:00 PM Guests that arrive late must contact the property ahead of time using information on the booking confirmation. Upon check-in, the resort reserves the right to inform the guest that a mid-stay move to other accommodations may be required.